Print prom dresses and gowns let you show off your own unique personal style. Choose an elegant floral print dress or show off your flirty side with an animal print dress for your prom or special occasion. Promgirl offers short sleeve print dresses with subtle polka dot or lace patterns as well as, bold, colorful geometric sleeveless print dresses. Trendy leopard print dresses and unique two-piece print dresses create the look of modern art made wearable. Strapless print prom dresses, floral print cocktail dresses with tulle, and elaborately detailed long print homecoming dresses are chic and unique. With so many styles to choose from, you may have a hard time picking just one. Shop PromGirl when in need of a unique casual print dress, long print dress or two-piece print dress for your next special event. Become a walking illustration of stunning patterns and designs, while wearing a short sleeve casual print dress or mid-length print dress. Popular floral print dresses and animal print dresses are distinct and finely detailed. A colorful sleeveless print dress is sure to get you noticed. Jeweled accents update the design of a casual print dress creating a bold and trendy look. Make a dramatic entrance when you arrive in a geometric patterned print dress for prom. The stunning abstract details of long print dresses mesmerizes the viewer with every movement. From office to afterhours, short sleeve casual print dresses are versatile and eye-catching. There are styles with sweetheart necklines and empire waistlines so you’re sure to find a one-of-a kind floral print dress or animal print dress you love. Two-piece print dresses can be appealing to the girl with her own fashion identity. 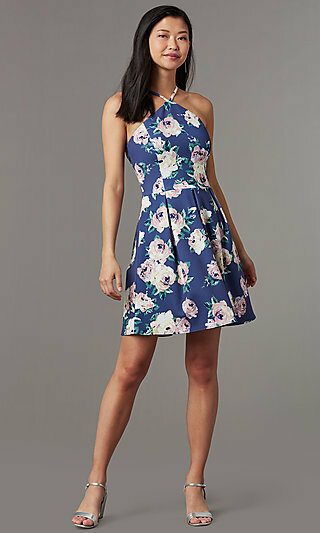 Sleeveless print dresses in satin show off your individual style effortlessly. Mid-length striped print dresses or contemporary short print dresses will have you dressed up for any occasion. The unique designs on printed prom dresses create visual dimensions that stir the imagination.